Nestled in a green area overlooking the bay of Scopello, close to the reserve of Zingaro, a few hundred meters from the beach of sand and white pebbles, come and discover Villa Guidaloca, a so calm and relaxing place, bathed by sweet scents of Sicilian orange and lemon trees that make up its private garden. It offers a breathtaking view of the sea. The villa, fully air conditioned in summer and heated in winter, has been completely renovated with high quality materials, modern equipment and high quality bedding. Of course, high-speed Wi-Fi is available for free. A large living / kitchen with air-condition, bright thanks to two large French-windows offering a splendid view of the olive grove and the sea. The living room has got comfortable sofas and a large table that can easily accommodate 14 people. The kitchen is fully equipped and has got a 90 cm oven and a 90 cm hotplate in order to cook easily for 14 people. The ground floor has got two quadruple suites, each consisting of two air-conditioned double bedrooms and a full bathroom with large shower cabin, for a total of 4 bedrooms and two bathrooms. A large lawn and an olive grove where children can play hide and seek. An outdoor shower with hot water. A living / dining room with a wood burning fireplace opening onto a patio with dining area and garden view. 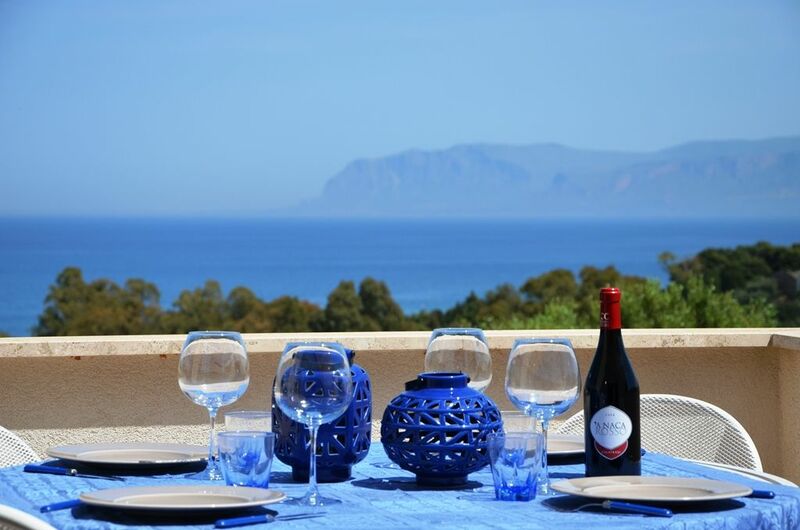 A fully equipped kitchen, bright and functional opening on a terrace with dining area and sea view on the Gulf of Castellammare ... .. Magic! A single room, with air condition and possibility to add a second person thanks to a second single bed. The attractions are not lacking. You will also find a book written by Nathalie in several languages summarizing all these tips as well as practical information on the region. Hoping to welcome you soon in our little paradise! Excellent accommodation. Very comfortable and tastefully decorated. Spent a week there with my husband and son (18 months) and we had an amazing time! The house if well equipped, very quiet and children friendly. Great grocery shop 1 min drive from the house. The owner is very knowledgeable about Sicily and very welcoming. Definitely recommend the property. "We stayed here for our honeymoon and we couldn''t have hoped for better. The villa is beautiful, clean and very well kitted out. We had breakfast on the viranda, looking over the sea each morning (no better way to start your day. )The owner is also lovely and extremely helpful. We walked into scopello a couple of times for an evening meal, this takes about 35mins and is a picturesque walk. Scopello its self is one of the most charming little villiages i have been to and the local beaches are stunning! We explored a lot of the region from the villa and nothing was too far (a car is a must). We will never forget our amazing week at this villa and we wll be sure to return." "Best location, perfect condition . We stayed for 17 days and didn`t want to go home. We went almost all over Sicily and we found this to be the most beautiful part." "This accommodation is as described. The apartment is very comfortable with everything needed for a relaxing holiday. The views from the apartment are stunning. The garden area with its outdoor kitchen and BBQ area is delightful. The apartment is private and quiet. The nearby beach (a few minutes by car)is lovely - it is stony so some beach shoes are useful. The village of Scopello is enchanting." "The house and the hostess were both delightful. The house was not only clean, but well stocked with supplies and staples--and included lots of additional amenities, such as an iron, washer and drier, plenty of olive oil, cleaning supplies, spices and herbs, laundry soap, etc. In short, the house was extremely well equipped. The hostess couldn't have been nicer. She was very helpful and accommodating, and her notebook and personal recommendations were hugely helpful for touring, shopping, eating out, etc. Except for a neighbor's frequently barking dog and a chain saw being used by workers at the house across the street one day, there was quiet and peace during our whole stay." "We have spent a lovely week (last in november 2004)in this nice appartment. We have travelled a lot in France and especially in Italy. We have stayeddifferent kinds of appartements but non so tastful and light - most in blue and white. The flat is clean, modern and you can see Nathalie's generosity and hospitality everywhere. Bottles of cold water in the refrigerator, spices and coffee-filter in the kitchen, toiletpaper in the bathroom, lemons in the garden to tast etc. We love good food and wine and are very curious what the region can offer. Nathalie, Giancarlo and Paola and Carla invited us to fantastic and unforgettable food events. Mille grazie!" Worth to be seen : The ancient village of Scopello with its handcraft and its typical restaurants, its terraces where to enjoy italian icecreams and sicilian 'granita' with lemon juice , its beautiful tunary where have been registered the sea sequences of the film 'Ocean twelve' with Brad Pitt and George Clooney -The harbour of Castellammare,its castle,its ancient walls,its typical restaurants and the possibility to rent some boats to admire the beautifull coast of the natural reserve of the Zingaro and to dive in its crystal-clear water. The owner speaks 4 languages and has been working in turism in Sicily for 1987. She will welcome you and give you all the necessary informations to spend some wonderful holidays in Sicily. In the meantime we invite you to have a look at our "Guide to western Sicily" which you will find on our website Dreamsicilyvillas.